Tatt vel imot.Reint og fint.Kan anbefales. Firstly we would like to thank Marie for the use of her villa and especially her team for their time and effort, who are only a text or phone call away and on hand at any time for anything. The villa itself was very clean and tidy fresh towels and bed linen provided and basically anything that was needed to make your stay more enjoyable . 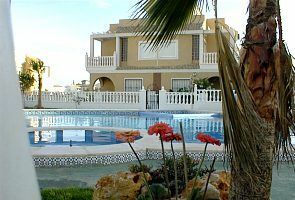 The villa itself is set in a quiet picturesque location and is only a hop skip and a jump from the pool where the whole family enjoyed many a day . The villa is situated near to all local ammenaties ,the bars and restaurants were in abundance and reasonably priced and well worth a visit and such a variety, the beach is a ten - fifteen minutes walk away but worth every step, the local mall is well worth the fifteen minute walk , my only regret was we didn't hire a car to find out what Cobi Roig and surrounding areas had to offer but hey there's always next year???? On the whole the villa was like home from home but with way better weather and the whole family enjoyed it and hoping we could do it again next year. Again thank you Marie and team for everything. Thank you Paul & Amanda for taking the time to review. I love guests like you who enjoy and make the best of every moment of a holiday! We did not rent a car but the villa is ideally located within walking distance to everything ie beach, shops, restaurants & pubs and taxi rank if required. We spent most of the time at either the beach or the pool but did do a day trip to the water park (really good fun) and the girls made a few visits to La Zenia Boulevarde, Personally, I have to say the early morning walk along the coast is beautiful and well worth doing. Cabo Roig itself is a very friendly spot. Eating out was very good and we were surprised at how reasonable it was. Debbie is a lovely person and extremely helpful. Thankfully we only had to call on her to top up the electricity but it was a great comfort to know that she was only a text/phonecall away. Overall, a great experience and really enjoyed by all. Immaculate villa, comfortable and well equipped . May I take this oppertunity to thank Marie and her team for being so accomodating and considerate thus making our stay at Sol Beach so thoroughly enjoyable . The villa was superb, well equipped , with everything in pristine condition .The equipment provided was second to none and I was pleasantly surprised to find lots of personal touches . There is a beautiful pool close to the villa , which was also very well maintained. There are an abundance of excellent restaurants within walking distance, and all reasonably priced . Overall , we had a wonderful and relaxing break which we thoroughly enjoyed . I hope we will be fortunate enough to book again in 2017 ! Renewed thanks to you all . Steve Randall and family . The house has a very good location. Near the beach and near a large shopping center. The private pool is very good maintained and not so Busy. However we visited in the last month of June, it might be different during the high season. The house itself was also great. Airconditioning worked fine. You will have to pay for the use of it but this was a very reasonable amount of approximately 20 EUR a week. The rooms and beds were well maintained. Its like coming to your own place. The pool is located just 50 m from the house, not to far and not to close. Part of the garden faces north, which in Sweden is regarded as bad. However in Spain this is almost preferred since the sun stand so high in the sky. You can easily eat you breakfast in the garden in the morning without getting grilled by the sun, and enjoy the evening sun in the late afternoon. The house owner Marie was very helpful and kind, she provided us with everything we needed. Summarising our stay, just perfect. Thoroughly satisfied by this gorgeous property! My girlfriend and I stayed in this villa in early June, before peak season was in full swing, and this property provided exactly what we had hoped and much much more! We flew into Alicante airport and our transfer which was organised through Marie, the owner, was awaiting our arrival with a friendly smile and a helping hand (just what you need after a day of travelling). We were delighted to see that the place was clean and tidy on arrival with beds made, fresh towels etc. The place is spacious and airy and there is plenty of space to move around. The balcony off the main bedroom on the first floor is a gorgeous area to read or have a cup of coffee and catch some sun while the roof is equipped with deck chairs and cushions to work on your tan! One of the massive advantages of this villa is that everything you could possibly need is there, and I mean EVERYTHING! From salt & pepper to a selection of books and even toys for the kids on the beach! My girlfriend was looking for nail varnish remover and I jokingly said look in that cabinet and believe it or not it was there! Every room was equipped with a ceiling fan which was a welcome retreat from the midday heat and the bedroom came with its own individual fan also. The beds were comfortable and clean along with the bathrooms and showers. The complex itself is quiet and relaxing and could honestly cater for any demographic. Myself and my girlfriend are a young couple and lived next-door to two elderly couples and a family. The pool is gorgeous and is half a stone's throw from the villa, this is where we spent alot of time lounging and reading in the sun. The general atmosphere in the complex is relaxed and friendly which was very welcoming. The area of Cabo Roig itself is less than a 5 minute walk from the villa and boasts a host of attractive shops, restaurants and bars. We ate at a lovely Mexican place called the Poco Loco and would highly recommend. The restaurants are affordable and the customer service across the board is high. A great little Irish pub which is 2 mins in a taxi is Paddy's Point which is a more commercialised Irish bar which was always full with well trained staff and a great atmosphere too. Marie, our contact for the property went above & beyond the call to ensure we had everything we could possibly need and was truly a pleasure to deal with. We could not recommend this property more to anyone who is looking for a relaxing break in the sun, you won't be disappointed! 5 stars!! Thank you very much for your complimentary review. I love people, but in particular the young/and young at heart with a joie de vivre! It was my pleasure to host you and I am very grateful for your custom. See you again soon I hope! PAY USING PAYPAL IN STERLING...QUICK, SECURE AND EASY TO USE. BOOKING EARLY IS IMPERATIVE TO AVOID DISAPPOINTMENT. BOOK YOUR HOLIDAY NOW AND SAVE ON AIRFARES TOO!! (AUGUST: weekend to weekend bookings ONLY PLEASE) ######RETURN GUESTS SAVE A FURTHER 10%...................CHECK WITH MARIE! !################ * Non refundable deposit of £100 PER WEEK required to confirm all bookings. * Clean Fee €65 Extra payable locally on arrival **PAYABLE ON ARRIVAL: Fob & Key £/€ 100 AND Damage Deposit £/€100.....Refundable when you are leaving subject to no material damage + €20 Electricity Card. Thank You. (I will request I.D. for confirmation Of Booking).